Never Seen Before, a 26/1 outsider, produced the run of his life at Seoul Racecourse this afternoon to win the Minister’s Cup – the final leg of the 2014 Korean Triple Crown – and hand Australian trainer Peter Wolsley the biggest win of his Korean career. Unsurprisingly, it was the Korean Derby and Oaks winning filly Queen’s Blade who was sent off as the solid favourite for the 10 furlong test, with plenty of support too for fellow Busan raiders Gumpo Sky and Success Story. It was the latter of these, Success Story who set the early pace under Jo Sung Gon, bounding out of gate 15 and going across to take the lead into the first corner. 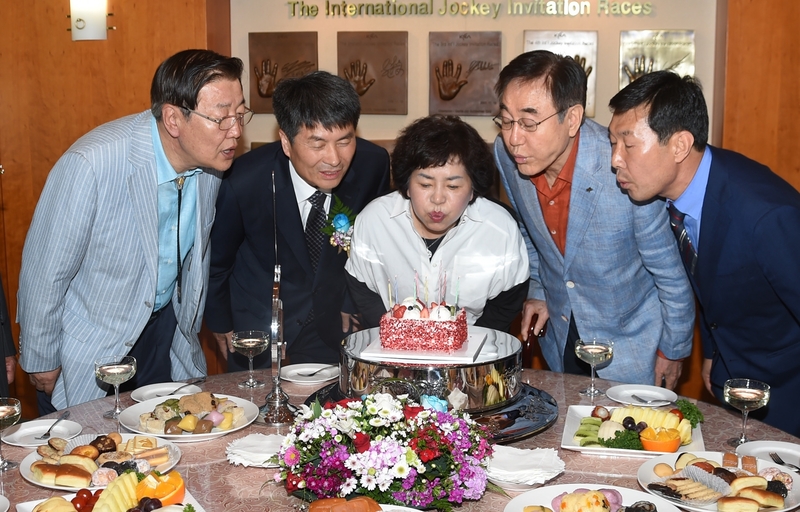 He would maintain it for much of the race, with Queen’s Blade, under You Hyun Myung for the first time in the absence of regular jockey Kim Yong Geun, in close attendance throughout. Meanwhile, Never Seen Before sat patiently in the front half of the field with plenty of cover. As they swung for home it looked like Queen’s Blade was ready to strike as Success Story went to the rail. The Derby and Oaks winner though had nothing. Instead, Gumpo Sky and outsider Ganghae came through the middle while Never Seen Before came around to fight out the finish. By the furlong pole, Success Story and Ganghae had been seen off and it was a straight duel between Gumpo Sky and Never Seen Before, the outsider finally getting in front 50 metres from the finish and pulling away for a half-length win. Ganghae ran on gamely for 3rd with Success Story 4th and Queen’s Blade a further 4-lengths back in 5th. Never Seen Before moves on to five wins from ten starts. There looks to be more to come too from Gumpo Sky while Ganghae was a revelation in 3rd. 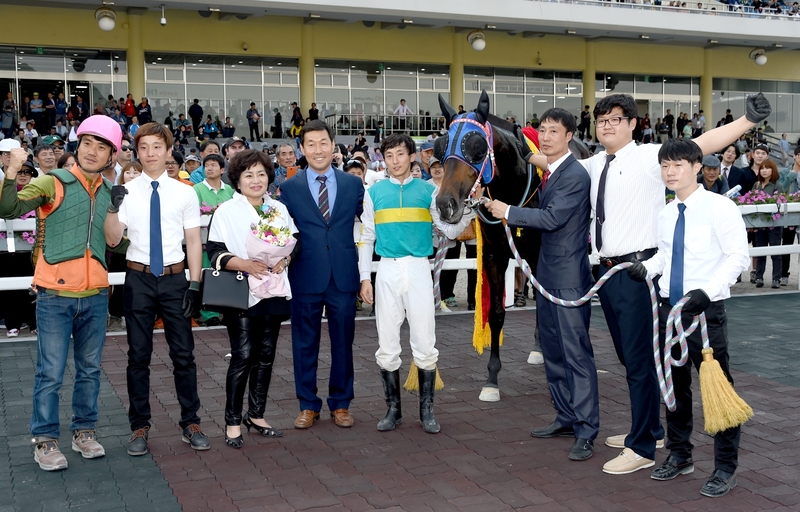 For winning jockey Lee Hee Cheon, it was unquestionably the pinnacle of a tough career to date. Wolsley is far too much of a diplomat to say so but it is likely that Lee was at best 2nd or maybe 3rd choice for the ride after stable jockey Jo Sung Gon opted to go elsewhere and You Hyun Myung got the ride on Queen’s Blade. Lee, who 8 years since turning professional still has only 92 winners to his name, gave the colt the perfect ride. Those of us – including this blog – who doubted his ability to close out a tight finish when the pressure is on, were emphatically put in our place. He was superb. As for the trainer, over the years we’ve written plenty about Peter Wolsley. The 51-year-old Aussie arrived in Korea in late 2007 (coincidentally around the same time this blog started) and endured an extremely rough first couple of years at first, taking charge of the “breakdown barn” – the horses no-one else wanted to train. Slowly but surely, he started getting winners and when there are winners, suddenly there are more owners and more – and better – horses. His stable is now firmly established as second only to the Kim Young Kwan machine in terms of winners. What had been missing until recently were the big ones. Old favourite Khaosan won Wolsley his first Group race back in September 2011, although it was by virtue of being promoted from 2nd after Cheonnyeon Daero was disqualified. Late last year, Secret Whisper took the Gyeongnam Governor’s Cup by a head to land what would be Wolsley’s biggest victory until today. In many ways, Wolsley is the exception that proves the rule. It is extremely difficult for foreigners to make a go of things in Korean racing and his achievements standing out so much only emphasize this. But his success is no accident. Seven years of sheer hard work against all odds paid off in full today and he deserves every plaudit. The bars of Gimhae will need to be fully stocked with Martini Rosso and Coca Cola tonight. A field of 15 will contest the 17th Korean Derby at Seoul Race Park this coming Sunday. 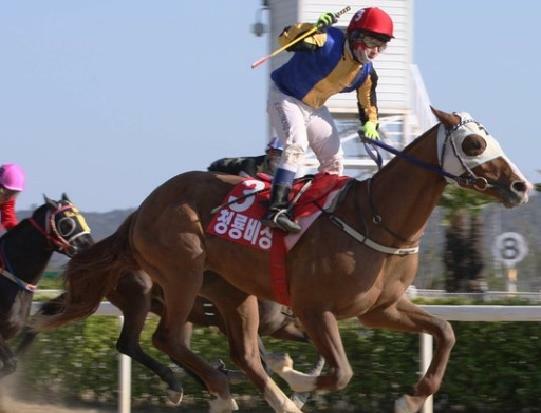 Cheongnyong Bisang took the first leg of the Triple Crown, the KRA Cup Mile at Busan last month and he returns to his home track to seek to take out the second jewel. An unprecedented 5 foreign jockeys have rides in the race. Korean racing stalwarts Joe Fujii, Masa Tanaka, Ikuyasu Kurakane and Darryll Holland are joined by newcomer Shinichi Terachi. With trainers Peter Wolsley and Bart Rice both saddling runners, it is set to be the most international running of the Derby to date. Set the pace for much of the Cup Mile and ran on well to finish 4th at generous odds. He has every chance of improving here and if he gets the lead and others have a bad trip, he just might keep it. Bart Rice is the new star of the Busan trainer colony and he saddles his first Korean Derby runner here. Gangchi made little impact in the Cup Mile and will need to show a lot of improvement to challenge here. A winner over the distance, albeit at class 4, he has a nice turn of foot and likes to come from just behind the leaders. Could be worth a place interest. Lightly raced and untried at further than 1400M and hasn’t won at higher than class 5. Has plenty of promise and has never finished worse than 3rd but is difficult to recommend here. Won a minor event on Cup Mile day and yet to go further than a mile. Kim Young Kwan doesn’t bring horses to Seoul unless he has high expectations though and with Darryll Holland on board, punters will take note. Comes into the race in excellent form with two consecutive wins behind him, the most recent of which was just 2 weeks ago over a mile. Expect him to be close to any early pace, he’ll need to show a bit more speed than he has to date in the home straight to challenge. Peter Wosley is searching for his first winner at Seoul and while this colt is not without claims, he will have to improve to win this. Rallied well for 2nd over a mile last start and if he comes on here, he could cause problems at the business end of the race. Sent off as the odds-on favourite in the Cup Mile, she finished a disappointing 5th having shown briefly at the front with a furlong to run. The half-sister to 2008 Oaks winner Jeolho Chance will have plenty of backers to put things right here. Kim Young Kwan will no doubt have fixed her final furlong but will others have come on more? The closer never closed in the Cup Mile, staying in 11th position the whole way around. Needs others to run poorly to have a chance. Little to recommend this one-time winner who is yet to start at further than 7 furlongs. 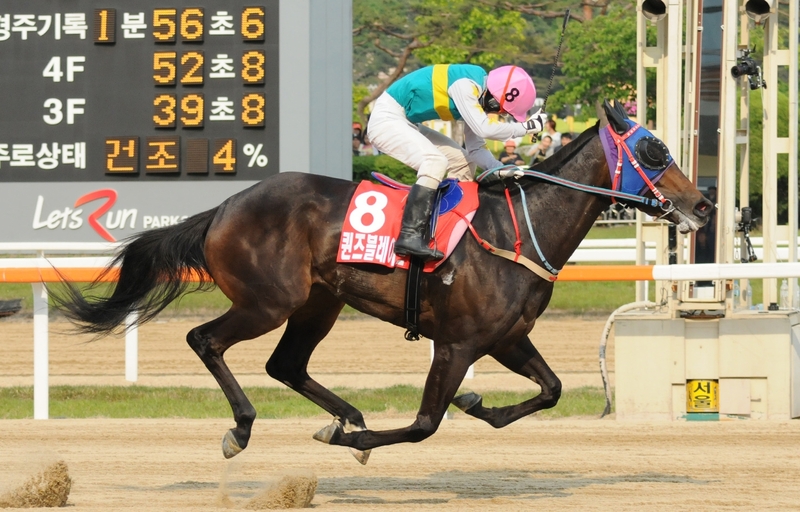 Japanese jockey Shinichi Terachi gets a first Derby ride in just his 2nd week in Korea. The Oaks may be a more realistic target for this filly but she’s a frontrunner with a quick finish who’s beaten colts before. These may be a bit too good though. Was in great form until a disappointing 5th last time out. The surprise package of the Cup Mile, he closed very strongly to land third. Joe Fujii rode Speedy First to win this race last year and while he’ll not be favourite to win here, heis not without a chance. The Cup Mile winner and favourite. He was superb in Busan last month and if he repeats that form, he wins. Cheongnyeong Bisang’s defeats have come when he’s had a poor trip and Seo Seung Un is going to have to work very hard to get him into his favoured position from gate 13. A decent filly but another for who the Oaks is a more likely target. A creditable 8th in the Cup Mile, a similar position here seems achievable. Had an abortive attempt on the Cup Mile but otherwise has form at this distance, winning a slowly run race here in March. This will be tougher though. While the great and good of Asian racing are living it up at the ARC in Hong Kong this week, back here in Korea we turn our attention away from the Steamed Spotted Garoupa Fillets and Ferrero Rocher for a moment because we are just over a week away from the big one. The 2014 Korean Derby will be run at Seoul Race Park on Sunday May 18. 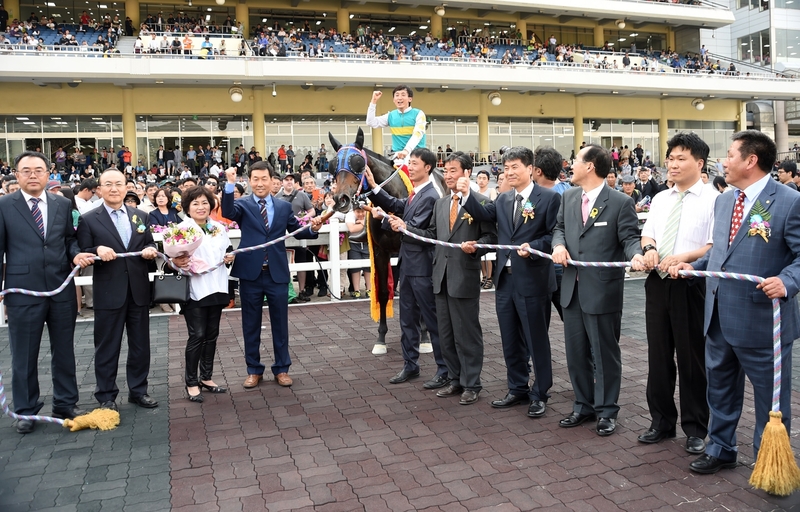 It’s the 2nd leg of the 2014 Triple Crown, the first jewel, the KRA Cup Mile at Busan last month, having been claimed by the capital raider Cheongnyong Bisang. He heads what is currently a field of 16 for the big race. Eight are scheduled to make the trip up from Busan. Peter Wolsley plans to bring two while Bart Rice is also set to have his first runner in the Derby in his first year training in Korea. Along with Cheongnyong Bisang, the next four home from the Cup Mile are also entered; Gilbert, Namdo Trip, Raon Morris and Queen’s Blade will be looking to improve on their showings. Cheongnyong Bisang showed that he was no Juvenile wonder as he landed a dominating win in the KRA Cup Mile – the Korean 2000 Guineas – at Busan this afternoon. 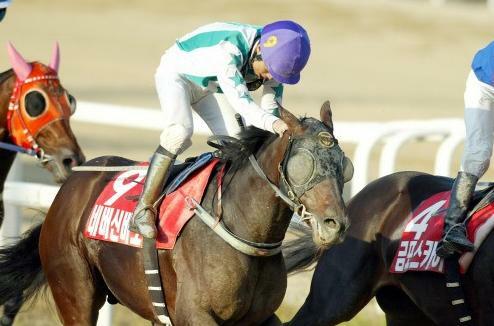 Despite having won the Breeders’ Cup and being crowned champion 2-year-old of 2013, Cheongnyong Bisang was sent off at odds of 20/1 for the first leg of the 2014 Korean Triple Crown. He duly made a mockery of those odds, stalking the leaders early on before unleashing a sprint that none could respond to. But for a short stint at the front, pre-race favourite Queen’s Blade showed little, ultimately fading and finishing in 5th and as her fellow pacesetters also fell away it was left to outsiders Gilbert and Namdo Trio to close strongly and push the winner to the line. Two horses threw away their chances at the start. First, Pureun Geotap reared in the gate and had to be scratched. 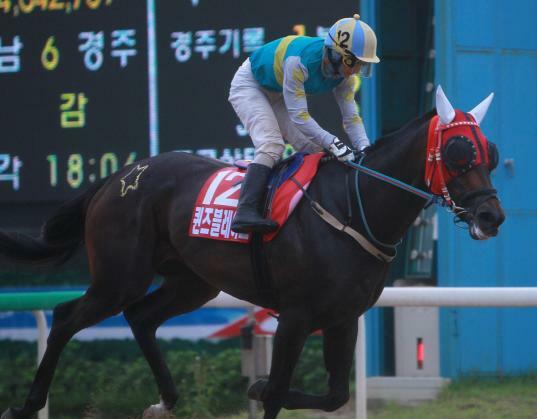 Once they finally did get underway Busan’s champion juvenile of last year Jungang Gongju missed the break and only managed to catch one horse by the end, continuing her recent run of poor form. Also disappointing was previously unbeaten filly Winner’s Marine who finished 9th after being sent off as the 2nd favourite. Aside from the three placers, Raon Morris put on a good show, leading for most of the way before being overcome at the end. He could be one to watch going forward. 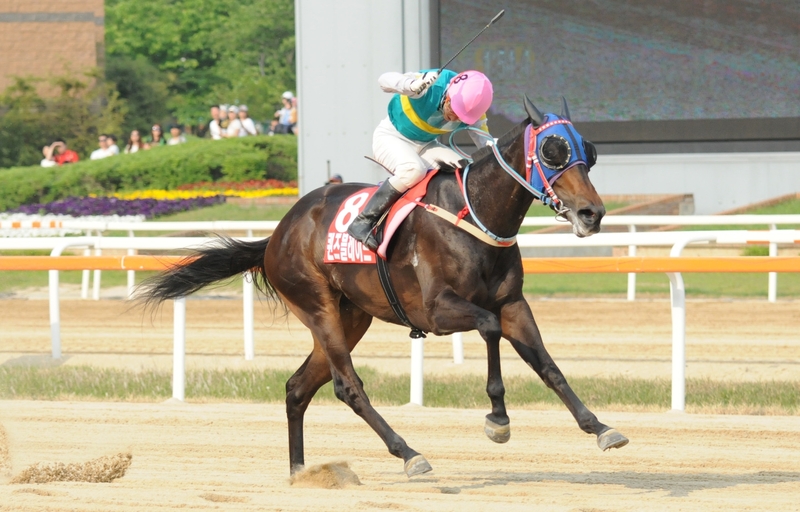 Cheongnyong Bisang is the first Seoul winner of the KRA Cup Mile since Money Car in 2010 and he did it in style. He’ll be the favourite as we head back to the capital for the Korean Derby on May 18.